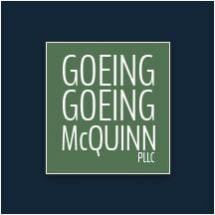 At Goeing, Goeing & McQuinn, PLLC in Lexington, Kentucky, we are invested in our personal injury clients’ futures. The attorneys in our law firm view practicing law as much more than just a career. We believe it is the way we can help our friends and neighbors in Lexington and throughout the state when they have sustained serious injuries in an accident. From our free initial consultations, our law firm’s goal is to secure our clients’ futures by aggressively advocating for their right to compensation when their injury or their loved one’s death was caused by the negligence of another. We know that each of our clients is going through a very difficult period of his or her life, and we treat him or her with the utmost care, sensitivity and respect. Our attorneys also strive to keep each client fully informed about the progress of his or her case and to promptly answer any questions that arise. Goeing, Goeing & McQuinn, PLLC prides itself on having the knowledge and resources necessary to thoroughly investigate the facts and circumstances of each client’s case. Since our law firm has established a name for itself in Kentucky, many of our clients’ cases settle without having to go to trial, but we are always fully prepared to do so when necessary.